Pillitteri Estates Winery has won over 800 wine awards from both local and international competitions. Many of our most prestigious awards are on display in our gallery at the entrance to the winery. In addition to wine awards the winery has received high praise from wine writers the world over. We are extremely proud of all the recognition we receive as it is a testament to our winemaking philosophy and our vision for the continued growth of the Ontario wine industry. In addition to wine awards we have received industry and government recognition which we are equally proud of. 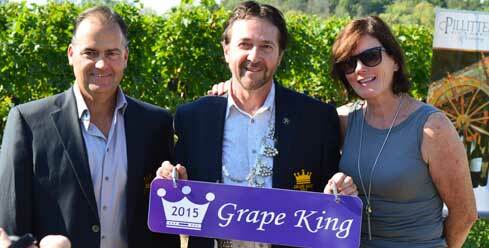 The Title of Grape King is given to the “Grape-Grower of the Year” each year, upon inspection of their vineyards and their commitment to the Ontario grape and wine industry. The finalists for Grape King are selected on specific merits including: knowledge of vineyard management, experience in the grape industry, quality of vineyard, health of vineyard. The King is then selected by a panel of judges who inspect all elements of the vineyard. The panel consists of viticulture experts from the Ontario Ministry of Agriculture, Food and Rural Affairs, Brock University’s Cool Climate Oenology and Viticulture Institute, the Grape Growers of Ontario and a Grape Grower of the Year Advisory Committee. The Grape King becomes an ambassador to the grape and wine industry and speaks at social and political functions throughout Canada supporting the industry. The Ontario Food Exporter Award recognizes an exporter’s successful expansion into new export markets, and their commitment to long-term export growth. The Award reflects the importance of exporting to Ontario’s agri-food industry: A strong industry creates new jobs, new investment, and fosters economic growth in communities across the province. Ontario is Canada’s leader in food production and, as such, the Ontario Food Exporter Award recognizes outstanding exporters who contribute to that success. Pillitteri Estates Winery won the Ontario Food Exporter of the Year Award in 2013. The award was presented by the premier of Ontario Kathleen Whynne, who called Pillitteri Estates Winery “an industry leader”. It recognizes the winery’s role in Ontario’s food industry and economy. In 2011 Pillitteri received recognition from the Ontario Ministry of Agriculture Food and Rural Affairs for their development of the Verona Appassimento Project. A project dedicated to grape and wine research, building towards the commercialization of Appassimento style wines. This project laid the foundation of our prestigious Riserva Famiglia series of wines but also developed techniques that many wineries now use for Appassimento styles of wines. In addition this project brought in the first ever plantings of Verona grape varietals to Canada. Pillitteri is proud the Ontario government recognized this innovative research project with the award. We will continue to be an innovative winery and strive to be an industry leader in winemaking and grape growing. Below is a list of the some of our recent wine awards from around the world. Click here for a complete awards list.